Sultanchapa, Punnag or Alexandrian laurel ball tree (calophyllum inophyllum, family: clusiaceae) is a medium-sized evergreen tree with profuse branches, attaining a height of about 12 m. The good-looking plant is seen in the coastal areas and Sundarban in Bangladesh. 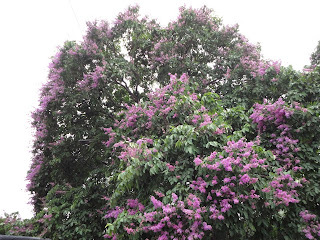 Its common English name is Alexandrian laurel ball tree. Leaves are smooth, shiny, leathery, dark green, 8-16 cm long, 6-10 cm wide, elliptic, tip rounded or obcordate (cordate at the tip); veins parallel, numerous, hardly visible. Flowers are white, showy, fragrant, borne on axillary raceme (10-15 cm long), with many yellow stamens at centre. It blooms in the rainy season. The fruit is a drupe, round-shaped, 3-4 cm in diameter, yellow when ripe. Propagation of the slow growing plant is caused by seeds and cuttings. It is grown in parks and gardens as an ornamental plant. Different parts of he plant are used in tumour, arthritis and heart disease. It is depurative and purifies blood. The tree is found in East Africa and from South and South-east Asia to Australia as well as in various islands between them. Other common names: Konyal, Katth-chompa.